Valletta 2018 Chairman Jason Micallef and Malta Philharmonic Orchestra Chairman Sigmund Mifsud earlier today at the Mediterranean Conference Centre. Some of the most prestigious names in classical music are coming to Valletta for a special edition of the Malta International Music Festival, with near-daily concerts spread over more than two weeks starting on 15 April. 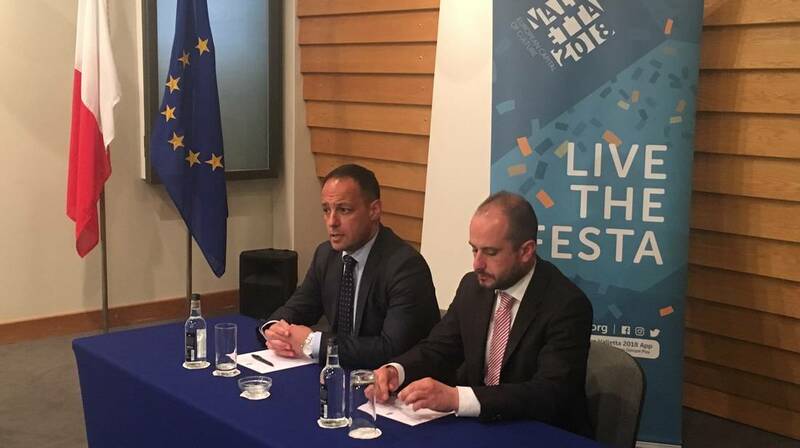 The Malta International Music Festival, which runs until 1 May, is being organised by the European Foundation for Support of Culture and the Malta Philharmonic Orchestra, with the support of the Valletta 2018 Foundation, whose chairman Jason Micallef described it as “the greatest classical music extravaganza ever held in Valletta” at a press conference held earlier today. This edition of the MIMF is the first in which the MPO is a co-organiser, though it had also performed in last year’s edition. This year, it will be performing in two concerts, and a number of its musicians will also be performing as soloists in a gala concert. MPO executive chairman Sigmund Mifsud welcomed the fact that the orchestra’s musicians were sharing a stage with some of the world’s finest musicians. The internationally-renowned musicians coming to Valletta for this festival include Grammy Award-winning Israeli violinist Maxim Vengerov, two gold medal winners of the Tchaikovsky International Competition – Russian pianist Grigory Sokolov and Armenian cellist Narek Hakhnazaryan, American violist David Aaron Carpenter, violinist Ray Chen, pianist Denis Kozhukhin, clarinettist Andreas Ottensamer and the Khachaturyan Trio. This year’s edition of the MIMF features 17 classical music concerts, ranging from piano recitals and chamber music to a large-scale concert featuring no less than two orchestras – the MPO and the Armenian State Symphony Orchestra – playing in tandem at Pjazza San Ġorġ. This concert, which will see the two orchestras perform a song cycle inspired by the Great Siege composed by Alexey Shor, will be held on 22 April at 8pm. The full programme of concerts and activities can be found on www.maltafest.eu, and tickets for all events may be purchased from showshappening.com.